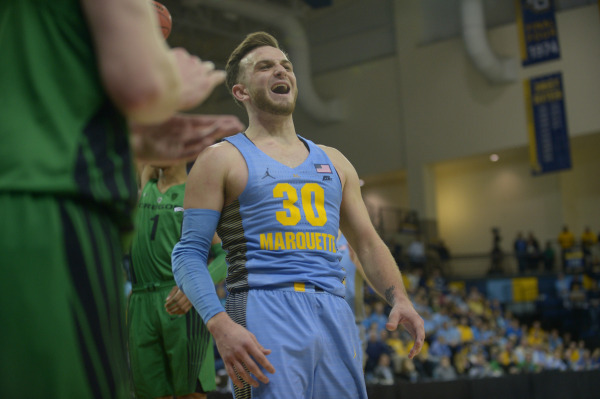 The Marquette Golden Eagles advanced to the NIT quarterfinals with a 101-92 win over Oregon on Sunday afternoon at the Al McGuire Center. Andrew Rowsey poured in 29 points and Marquette (21-13) led by as many as 25 before the Ducks used full court pressure to close the gap in the fourth quarter. Rowsey scored 22 of his 29 in the first half, tying his own career high with six 3-pointers in the first two frames. Markus Howard added 18 points but fouled out, along with Matt Heldt and Sacar Anim. Freshman Greg Elliott and Theo John added 13 and 10 points, respectively. MiKyle McIntosh had 25 to lead the Ducks (23-13). The Golden Eagles will host Penn State in the quarterfinals on Tuesday night at the Al McGuire Center. The Nittany Lions advanced by knocking off top-seeded Notre Dame.